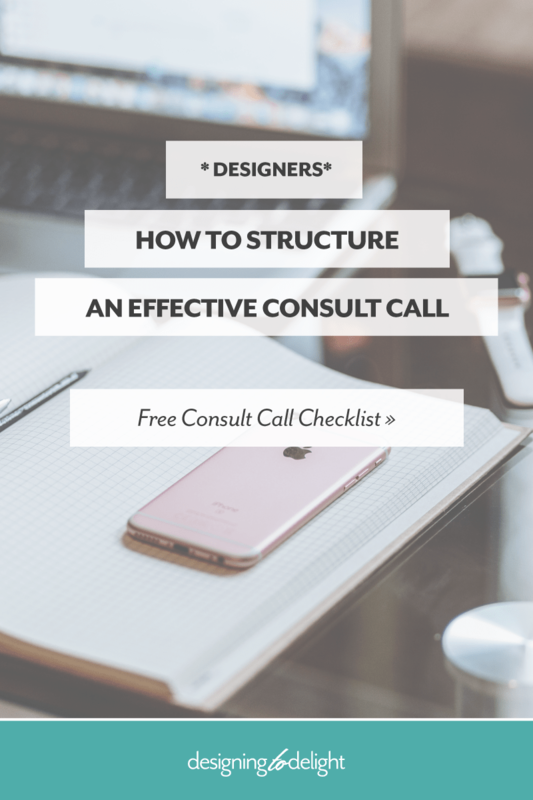 Initial consult calls are an opportunity to talk candidly with a potential client. These are not be confused with already-committed-to-the-project strategy calls. In my scheduler I actually call them a “Let’s Talk” call. This tends to remove the pressure to perform or land the job (you still want to put your best foot forward). My primary objective on this first call is to determine if I’m the right fit for this project. I’m interviewing them just as much as they are interviewing me. Not everyone who fills out my online inquiry gets invited a consult call. I used to talk to everyone who inquired, because I felt I should. But this is a waste of my time and theirs. I found I frequently ended up committing to projects that weren’t strategic for my business. I would encourage you to create a criteria for who you are willing to talk to. Start with an online inquiry form — create an online inquiry form that encourages potential clients to share goals, budget, and timelines with you so you. This will give you an idea of scope and client temperament before you respond. Extend an offer to talk to you — using a scheduling tool (for convenience, plus you’ll be making a good first impression), respond and extend the offer to talk to those who appear to be a good fit. AcuityScheduling.com, TimeTrade.com and Calendly.com are great options for scheduling tools. Send a reminder prior to the call — most scheduling tools have reminders built in, you can also send a personal note with a link to the conferencing tool of your choice. Record the call — I’m not the best at video, but I do it anyway because I like to see my potential clients. Video just takes practice. If you prefer the phone, use a free service like UberConference.com so you can easily record the call. If you prefer video, try Zoom.us, which will allow you to record a video call up to 40 minutes long for free. Don’t give any ballpark pricing on the call — even if they press you for it, don’t commit to anything on the phone (they will hold you to it, even if they say they won’t). Commit to providing a proposal by a specific date — if you feel the project is a good fit for you, commit to providing a proposal, giving yourself a some cushion so you can deliver a day early or on time. Email them following the call and thank them for their time — whether or not the project is a good fit, send a thank you email. If you aren’t going to pursue working with them, thank them and refer them elsewhere. If you would like to collaborate with them – email them and thank them – let them know when they can expect to see your proposal. 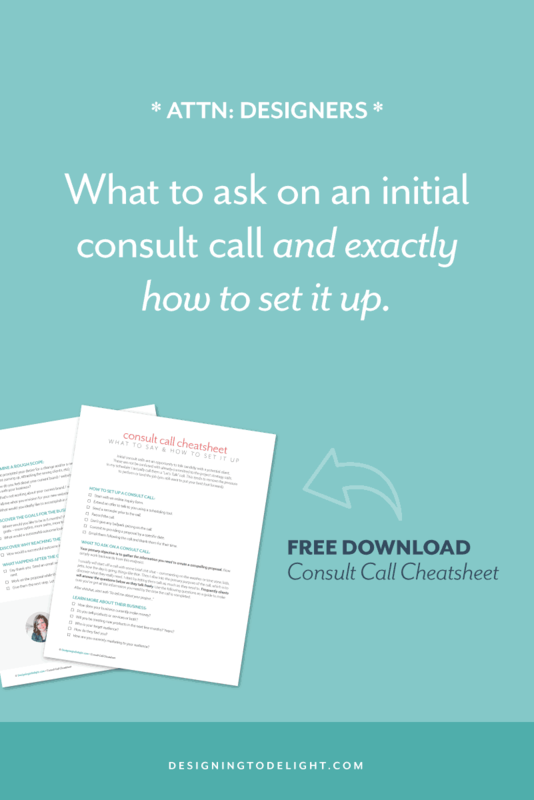 What should you talk about on an initial consult call? 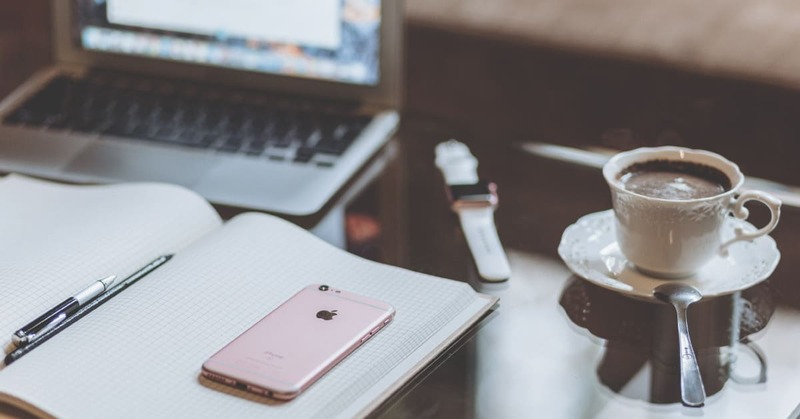 If this client turns into a good potential fit for you, then your primary objective is to gather the information you need to create a compelling proposal. Now, simply work backwards from this endpoint. I usually will start off a call with some brief small talk – commenting on the weather or time zone, kids, pets, how the day is going, things like that. Then I dive into the primary purpose of the call, which is to discover what they really need (and why they think they need it). I start by letting them talk as much as they need to. Frequently clients will answer the questions listed below as they talk freely. Use the following questions as a guide to make sure you’ve got all the information you need by the time the call is completed. I ask some of these questions on the online inquiry form, but now I want to go a bit deeper. Again, I don’t ask each question like I’m looking at a bulleted task list. I use these to keep the conversation going – fill in any areas where I’m looking for more explanation – or digging deeper to define their customer’s path. How does your business currently make money? Do you sell products or services or both? Do you enjoy it? Will you be creating new products in the next few months? Years? How are you currently marketing to your audience? Do you enjoy it? The following are usually answered in natural conversation, but I want to give potential clients an opportunity to talk about what has been successful and what hasn’t. Where do they feel frustrated? Have they seen something that inspires them? Why do they think they need something new? These questions will help you determine a basic list of needs and rough scope for the project, so you can provide a price range or suggest a design package (depending on how you work). How do you feel about your current brand / website? Does it accurately reflect where you want to go with your business? 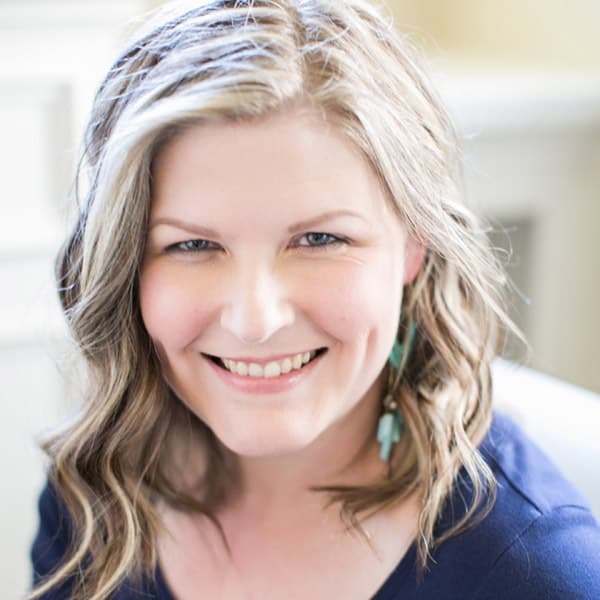 What’s not working about your current brand / website / ebook / etc? Tell me what you envision for your new website / ebook / logo / etc. What would you ideally like to accomplish in our work together? I ask the first question listed below on my online inquiry form. I’m looking for them to elaborate or clarify the answer they’ve already given through the inquiry. This helps me understand what’s motivating them to make a change now. Where would you like to be in 6 months? A year? What would a successful outcome look like for you? You don’t necessarily need to ask this question, but listen for things like quit my day job, leverage my time, create more impact, reach more people, hire a team. Identify their deep desire(s) and add that to your proposal objectives or overview. How would a successful outcome impact your business / life? This is basically what needs to happen. What specific deliverables or design package will be the best solution? You don’t have to have the answer to this on the call (other than an overview or big picture view). You’ll define this in your proposal after you’ve had time to think. Wrap up your call with your thanks, excitement to partner or work on the project (if applicable) and a commitment to respond within a specific timeframe. Send an email reiterating your thanks, your excitement and what they can expect next. Plan to work on your proposal fairly soon after the call while the details are still fresh. Listen / watch the recording and take notes. In your proposal, open with your understanding of the current problem and goals. Next, cover what needs to happen (your big picture recommendations). Then talk about what success looks like for your client and why it’s important. My proposals then move on to cover an overview of the typical process, timelines, specific deliverables, a proposed fee schedule and the what to do next. Send off your proposal and let your client know exactly what to do next if they want to work with you. I ask clients to approve the proposal or reply with questions to be answered via email or a call (whatever they prefer). Most clients will reply to me within 1 day to let me know they are considering it and need a little time, OR they approve. If I don’t hear after 2 days, I’ll follow up. I personally only follow up once, because chasing clients has never worked out very well for me. Also, never lower your price to accommodate a smaller budget. Instead, reduce scope or propose to do the project in phases. Dedicate your creative energy creating proposals ONLY for potential clients or projects that excite you. (OR are amazing or strategic for your business.) Do not create proposals for every project that comes your way. Remember, your first filter is your online inquiry. The second is your consult call. Use them wisely and you’ll stop creating time-consuming proposals that don’t turn into projects. What parts of the “consult call process” do you struggle with? Head over the Drama-Free Design Facebook group and tag me with your questions and comments. I’d love to talk to you.